The Mousehole Cat. One of the oldest European breeds, the British Shorthair traces its ancestry back to Roman times when the cats arrived with Roman soldiers and quickly spread across the English and European countryside. These working cats hunted rodents before becoming one of the first recognised breeds and show animals in the late 19th century. Nearly extinct after World War II it soon re-emerged as a popular pet during the late 1940's and 1950's. A skilled mouser and fisher, the mousehole cat is friendly and resilient in any kind of weather. Some myths point out that cats and mice are merely dependent creatures, bound by fate to endure one another's enmity, Aesop was fond of this paradigm and he expressed it richly in his "cat wife's tale". The myth is about a man who fell in love with a cat, but once a cat always a cat, and though the goddess of love has transformed the cat into a woman, the woman still leaps at a mouse and eats it on her nuptial night. In one Noah tale, common to world mythology, the devil has created a mouse to nibble a hole in the Ark; having done so, the mouse came face-to-face with a cat, who then ate him. Afterward, the hole was plugged by a frog. Another myth declares that Saint Francis learnt to be patient while the devil's mice nibbled his robe and his toenails. Perhaps his patience might have worn thin as the mice swarmed him. But, at last, a cat leaped out of his sleeve and put an end to them. Supposedly, that cat destroyed all but two mice. These slipped into a hole, and that is why cats stare at mouseholes to this day! 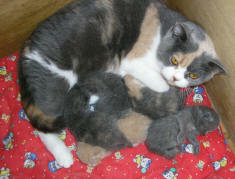 The "British Shorthair" has a variety known as the "Blue Spotted Tabby", due to its coat having the classic tabby pattern. The word Tabby comes from the name of the Old Quarter of Baghdad, at Attabiya. Silk fabric patterned in black and white and known as "tabbi" in the west was once made there. Originally, the cats wore only a solid blue-grey coloured coat that remains popular today, but many other solid, shaded, tabby and spotted patterns now exist.